Home » Case Studies » Warmth in church? more than just a wing and a prayer! Warmth in church? more than just a wing and a prayer! There aren’t too many buildings that offer a bigger challenge to heat effectively – and importantly cost effectively – than elderly churches. Cavernous buildings with high ceilings and draughty stained glass windows – parishoners either turn up wearing thick coats or the heating gets switched on 24 hours or more before the service takes place to expensively take the edge off the cold in winter months! Modern radiators offer a significant part of the answer to the problems of heating older churches, and don’t just ask Stelrad – ask someone who knows more about heating churches than arguably anyone else in the UK. 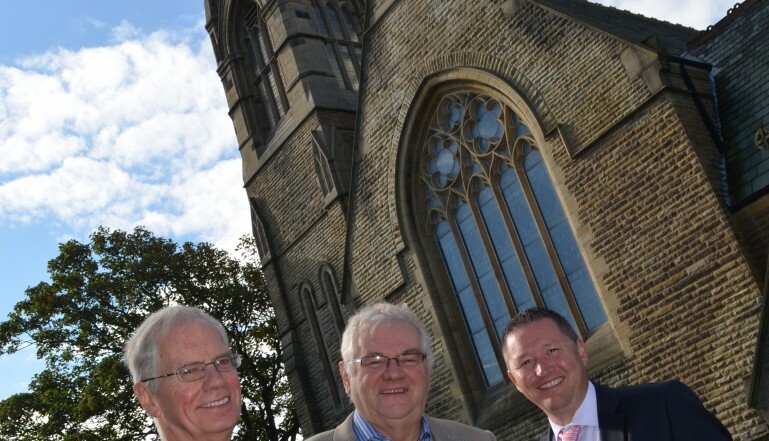 Chris Dunphy owns Dunphy Church Heating based in Rochdale. The company only installs and maintains heating systems in churches – and they’ve installed nearly 900 of them in churches across the UK in the past twenty years or so. Over the years the company – and in particular heating installation manager Mick Russell – has integrated new technologies into the systems they recommend. Many of the heating systems they replace have been struggling to heat the churches for decades, using elderly boilers – many have been coal or coke fired – using chunky old cast iron radiators – some that date back to the early 1900s! The heating bills the churches have had to pay have often been horrendous – and largely a waste of money as the system was simply not up to the job and at best kept churchgoers from freezing if they sat very close to the source of the heat – such as it was!! The latest church to get the Dunphy treatment was The Drive Methodist Church in Lytham St Anne’s on the North West coast near Blackpool. Originally built in the late 1800s, its heating system was driven by two elderly gas boilers – about forty years old – and a large number of cast iron radiators. The brief was to install a high quality modern condensing gas boiler driven system, in the church, the church hall and the lecture room, using the latest energy efficient radiators as the heat source around the building. Stelrad’s Paul Barlow is the company’s Business Development Manager in the North West and he liaises regularly with Mick Russell at Dunphy’s and recognised the opportunity in this project for Stelrad’s K3 Compact radiators – three panels and three convectors, providing exceptional heat levels from a smaller footprint. 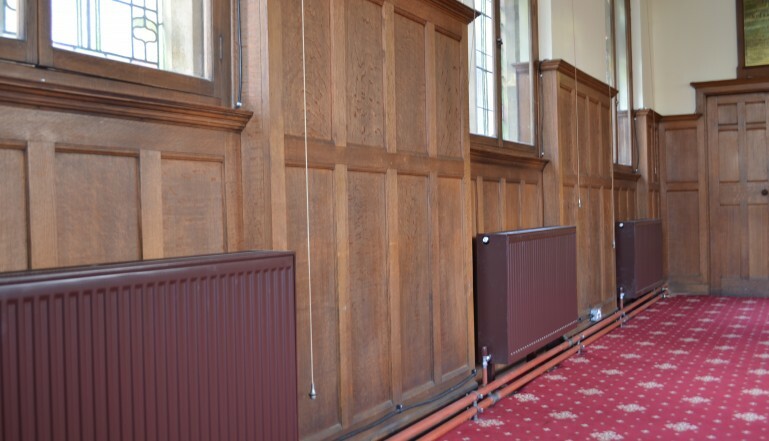 The project needed around 40 of these radiators in total and they were needed in a dark brown finish to match the colours of the pews and the panelled walls they would be mounted against – apart from a few white versions for the church hall. The system is driven by two Potterton Sirius Two Wall Hung 110kw condensing boilers with a full modulating sequenced boiler arrangement set-up coupled with a Spirocross hydraulic de-aerator and dirt separator, Spirocross Superior fill unit & Spirocross automatic air vents. Each zone being individually powered by its own Grundfos fully modulating Magna pump.The boiler room has been transformed to a “state of the art showpiece”, using half the space previously used. The project was complicated slightly by the church being a listed building – with things like the requirement for some of the elderly cast iron radiators having to be left in situ despite not actually operating! The high roof benefits from very little insulation and the large stained glass windows provide plenty of opportunity for warm air to leak out of the building and for cold air to seep into it! But the sheer volume of heat generated by the new Stelrad Compact K3s, make the church a far nicer place to be than was previously the case!